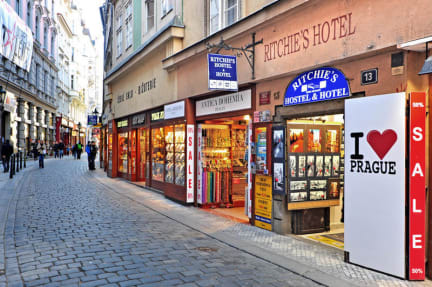 Ritchie's Hostel & Hotel located between Old Town Sq and Charles Bridge in the heart of the Old Town is the best starting point for exploring Prague. All significant monuments can be reached in a couple of minutes of walking. It does not matter if you come to visit monuments, shops or parties, all is really close. We offer a great quality for all budgets. Our guests choose among a wide range of rooms - from cheap dorm rooms (with a shared bathroom) to private rooms with own bathroom. At the moment, 3 kinds of dorm rooms are offered - mini dorm (shared bathroom, 3 persons or 5 persons, private bathroom), dorm plus (own bathroom) and cheap dorm (shared bathroom). In addition to shared dorms we offer private rooms (single, double, triple, quad, for 5, 6 or 7 persons) which are with own or shared bathroom. Free linens as well as towels are included for dorms as well as for rooms. A continental breakfast buffet (for only 4 EUR/person/day) is provided every morning in our dining room. It includes different types of bread, cereal, musli, juice, fruit as well as cheese, salami and jam. If you prefer to cook your own meals, we have a spacious, fully equipped guest kitchen available for free. The hostel and its rooms are equipped with a highly modern keycard system which is used not only for the room dorms but even for the main entrance door.